activation of the program on a new device (or a new SD card – applicable for Windows CE only). When you update existing maps or activate additional maps, it is highly recommended to update the activation file via the program menu. Please note that Internet connection is required. Run Navitel Navigator, then choose Menu → My Navitel → Updates. Wait for the information about available updates to load. If you have received a message “Connection is forbidden”, then allow the connection in Settings. To do so, go to Menu → Online services and choose Allow under Internet connection. Then go back and check for available updates. If software and/or map updates are available, follow the instructions to install them. If your device is running on Windows CE and has no Internet access, use Navitel Navigator Update Center for PC to update your navigator. Manual replacement of the activation file is only needed when it is impossible to access Internet from your device. The described method is only applicable to devices running Windows CE and Android. Connect your navigator to PC with a USB cable. If the program is installed on an SD card, it is enough to connect this memory card to PC using a card reader. Delete the dated activation file NaviTelAuto_Activation_Key.txt and/or NaviTelAuto Activation Key.txt from the folder with the program in the inner memory of the device or on the SD card. The name of the folder can be Navitel, MobileNavigator, NaviOne or else depending on the model of your device (this folder contains executive *.exe file and files navitel.ns2 and timezones.tz). Clear Licence folder inside NavitelContect folder in the inner memory of the device or on the memory card. Download a new activation file to your computer. You can find the link to download it in your account in the section My devices (updates) under the name of the device. If you activate an additional map – “I already use Navitel Navigator and would like to activate the key for additional map”. In all other cases – “This is my first activation of Navitel Navigator”. Copy the downloaded file NaviTelAuto_Activation_Key.txt to the folder with the program files in the inner memory of the device or on a memory card. The name of the folder can be Navitel, MobileNavigator, NaviOne or else depending on the model of your device (this folder contains executive *.exe file and files navitel.ns2 and timezones.tz). Make sure that the name of the copied file is NaviTelAuto_Activation_Key.txt. The file name must not contain any additional characters (e.g. brackets or numbers). Rename the file if necessary. NOTE: the operating system may hide known file extensions. If the file extension .txt is missing from the file name, there is no need to add the extension name manually. In application data (you can access this catalogue only if you have root privileges): /data/data/com.navitel/. If you have no root privileges, it is necessary to clear Navitel application data in Android Settings. 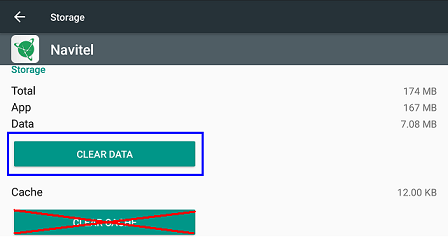 To do so, press “Clear data” or “Delete data” in the card of Navitel application. It's not enough to clear cache! Connect your device to PC. If it is impossible to connect the device (as it would be the case with a car stereo), connect the memory card to PC. Make sure that the name of the copied file is NaviTel_Activation_Key.txt. The file name must not contain any additional characters (e.g. brackets or numbers). Rename the file if necessary.